To Samuel Bakke on the "Ships starting with S" page. This is a post war picture sent to me by Paul Racine who was on board in 1961. He says it was taken as they entered the harbor at Liexoes (Oporto) Portugal and adds: "I signed on in London at the shipping office at Lancaster Gate (just off Bayswater Road). The trip I did on the Bakke lasted over 5 months and was a great experience. First port of call was Riga in the USSR then we sailed to Cuba. This was just weeks before the Americans blockaded Cuba and the start of the missile crisis. We unloaded phosphates and other questionable crated goods and stayed in Havana for over a month". Tonnage: 4719 (4744?) gt, 2835 net, 8330 tdw. Dimensions: 407.6' x 54.7' x 25.0'. Machinery: 2 x 6 cyl. 4T EV Götaverken-B&W, 3000 bhp, 10.5 knots, 2 propellers. Liner, delivered in July-1929 from A/B Götaverken, Gothenburg as Samuel Bakke to Skibs-A/S Samuel Bakke, (Knut Knutsen O. A. S.), Haugesund. July 2 Los Angeles New Westminster July 7 Independent Missing movements? Febr. 23 Liverpool   OB 290 Dispersed Febr. 27. Aug. 23 Columbia River San Francisco  Independent Page 2 gives arrival Aug. 25. Nov. 7 Liverpool   ON 34 For Vancouver. Aug. 24 Liverpool New York City Sept. 7 ON 250 Convoy will be added. Oct. 31 Liverpool New York City Nov. 15 ON 263 Convoy will be added. March 22 Methil* Southend March 24 FS 1764 *From Hull. March 27 Southend New York City Apr. 14 ON 293 Convoy will be added. Apr. 29 New York City Liverpool May 15 HX 353 Convoy will be added. May 27 Liverpool   ON 305 Detached independent, May 30. According to a story found in the Norwegian magazine "Krigsseileren" No. 2 for 1971, Samuel Bakke rescued survivors from the French Picardie (ex Norwegian Kollgrim) early in 1940. It's written by someone who was on board Samuel Bakke at this time, Roll Smith, who says they had departed Kopervik, Norway on Jan. 17-1940 heading for Panama in ballast, but due to a persistent storm which increased in intensity as they approached the U.S. east coast, they turned towards the Azores. When they were about 24 hrs away from the Azores they saw a light in the horizon and decided to investigate. As they came closer they could see it was half a ship, the after part of a tanker. They signalled to the vessel, asking how long she could stay afloat, but all they got was "SOS, Wait". They circled around the wreck all day the following day, encouraging the survivors to jump overboard and swim towards the lines they had thrown out, but nobody dared, and the seas were too heavy at the time to launch a lifeboat. Samuel Bakke's 2nd mate knew a little French and was able to establish that 12 men were missing, both lifeboats were gone and the ship had been drifting for a week. When the wind calmed down somewhat that night the 2nd mate and 6 men from Samuel Bakke launched a large lifeboat and disappeared in the dark, then about one and a half hour later they signalled that they were on their way back. 14 men were taken aboard Samuel Bakke before the boat headed back to the French ship and another 14 men were rescued; by 4 in the morning the rescue operation was completed. Samuel Bakke stopped in Guadeloupe in French West Indies for fresh water and landed the shipwrecked men there (no date mentioned); there's an indication they were later taken to Halifax on a French cargo ship. Samuel Bakke eventually reached Panama, the voyage having taken 30 days altogether. She subsequently headed for Vancouver, and 49 days after they had left Norway they could finally get some leave and go ashore. (Picardie, ex Kollgrim became the Norwegian Sirefjell in 1949; my text under Kollgrim has more info). For information on voyages made in between those mentioned here, please see the documents received from the National Archives of Norway and A. Hague's Voyage Record above. Follow the convoy links provided for more information; some also include the Commodore's notes and various reports and several Norwegian ships took part. According to Page 1 of the archive documents, Samuel Bakke was on her way from Cristobal to Halifax when war broke out in Norway on Apr. 9-1940. From Halifax, she joined Convoy HX 36 on Apr. 18, bound for Glasgow with general cargo in station 13 (the Norwegian Mosfruit and Titanian sailing beside her). She arrived her destination on May 3, and a month later, we find her in station 32 of Convoy OB 160, leaving Liverpool on June 2, dispersed June 5, Samuel Bakke arriving Cristobal on June 21, proceeding to Los Angeles the next day. She headed back to the U.K. on Aug. 23 in the Bermuda portion of Convoy HX 68, bound for Manchester with a cargo of lead and lumber, arriving there on Sept. 10. The following month, she's listed in Convoy OB 226, which left Liverpool on Oct. 9 and dispersed on the 12th. Her destination on that occasion is given as Panama, station 71; according to the archive document mentioned above, she arrived Cristobal on Oct. 30, continuing to Los Angeles and Vancouver the next day. (Ref. external links provided in the Voyage Record for more info on the OB convoys; other Norwegian ships are also named). In Jan.-1941, she's listed Convoy HX 101, again joining from Bermuda, bound for Liverpool with lumber, lead and general cargo, arriving Jan. 22, remaining there for a month (Page 1). She subsequently served as Commodore Ship for Convoy OB 290 which was attacked by U-47 (Prien) as well as by aircraft (Borgland and Solferino were sunk - follow links for details). Commodore was R. A. Hornell. Samuel Bakke, in station 41, had some very close calls during the attack by FW 200's on Febr. 26, especially when a bomb hit her deck, but it ricocheted and detonated in the sea. Hornell's report indicates that the gunners hit one of the aircraft, and due to their excellent performance she escaped total destruction. I've added the abstract of Samuel Bakke's log describing the attacks, as well as Admiral Hornell's report to my Convoys section - follow the link to OB 290 above (ships sunk/damaged are also listed). The convoy left Liverpool on Febr. 23 and was dispersed on the 27th, Samuel Bakke arriving Halifax on March 7, proceeding to Cristobal the next day, then on to Los Angeles and Vancouver again. With a general cargo for Liverpool, she headed back to the U.K. on May 29, joining the Bermuda portion of Convoy HX 130. Cruising order/Commodore's notes are also available. In July, we find her in Convoy OB 344, departing Liverpool on July 7, dispersed July 16. Her destination is given as Vancouver; according to Page 2, she arrived Kingston, Jamaica on July 23, proceeding to Cristobal that same day, then on to Los Angeles and Vancouver, arriving the latter on Aug. 11. In Oct.-1941 she was in Convoy HX 154 from Halifax, together with the Norwegian Hilda Knudsen, Kaia Knudsen, Ranja, Tai Shan, Emma Bakke, Polarsol, Skiensfjord, N. T. Nielsen-Alonso, Toronto, Noreg and Svenør (Samuel Bakke arrived Manchester Oct. 25). Some of these ships, including Samuel Bakke, subsequently returned with the westbound Convoy ON 34, which left Liverpool on Nov. 7. Acanthus is named among the escorts. Samuel Bakke arrived Cristobal on Nov. 30, the convoy having been dispersed on the 21st. From there, she continued to Los Angeles, where she had quite a long stay before heading to Vancouver. On March 15-1942, she can be found among the ships in Convoy HX 180 from Halifax, which arrived Liverpool on the 27th. Samuel Bakke proceeded to Ellesmere Port, then Manchester, with arrival Apr. 1 (Page 2). She subsequently headed in the other direction again with Convoy ON 89*, which left Liverpool on Apr. 23 and arrived Halifax on May 5; Samuel Bakke, however, was bound for New York, where she arrived May 7. At the end of that month, she's listed in Convoy HX 192 from Halifax, with U.S. trucks on her deck, later returning with Convoy ON 107*, which departed Liverpool on June 26 and dispersed July 9, Samuel Bakke arriving New York the next day. On July 27, she joined Convoy HX 200 from Halifax. Acanthus is again named among the escorts, as are Montbretia and Potentilla. Samuel Bakke arrived Manchester, via Belfast and Liverpool, on Aug. 15 (see Page 3), returning to the U.S. with Convoy ON 125, serving as Commodore Vessel in station 51; according to A. Hague, the Vice Commodore was in Skiensfjord. Samuel Bakke went back across the Atlantic with Convoy HX 209 from New York on Sept. 24 (this time, the Commodore was in Skiensfjord), and the following month, she served as Commodore Vessel for Convoy ON 141* (from Liverpool Oct. 24, to New York Nov. 10). On Nov. 19, we find her in station 45 of Convoy HX 216, bound for Mersey with a general cargo and ammunition, returning to the U.S. on Dec. 19 with Convoy ON 155, arriving New York Jan. 6-1943. Acanthus was among the escorts for a while, as was Eglantine. Narrative of passage is also available for this convoy. On Jan. 22-1943, she's listed in Convoy HX 224, bound for Manchester in station 101 (it looks like she had been cancelled from the previous convoy, HX 223, from which Nortind and Kollbjørg were sunk - follow the links for more info). Samuel Bakke arrived Manchester, via Liverpool and Ellesmere Port, on Febr. 10/11 (according to the Commodore's notes for this convoy, she was among several ships that parted company in the afternoon of Febr. 4 - follow link for details). She returned to the U.S. in March, having sailed in Convoy ON 170, and the following month, she can be found in Convoy HX 234 from New York - see also the Commodore's report on passage (Commodore was in Laurits Swenson). In May, she served as Commodore Vessel for the westbound Convoy ON 184*, departing Liverpool on May 15, arriving New York May 31, then sailed back to the U.K. on June 15 in Convoy HX 244, bound for Manchester with general cargo and passengers, station 63, this time acting as Vice Commodore Vessel. She arrived Manchester, again via Liverpool and Ellesmere Port, on July 3 (Page 3). 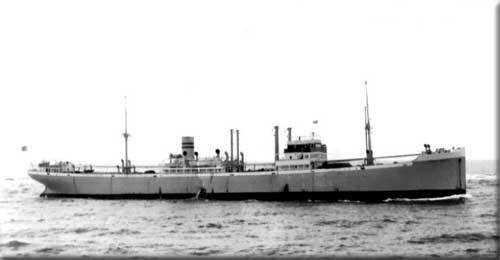 We now find her in the westbound Convoy ON 193*, departing Liverpool July 16-1943, arriving New York July 31, and on Aug. 14 she joined Convoy HX 252 (in which Santos was lost - follow the link for info), destination Glasgow with general cargo, also carrying explosives, 8 passengers and movies, station 54. The Commodore's narrative and several reports are available for HX 252, follow the link to my page about this convoy. 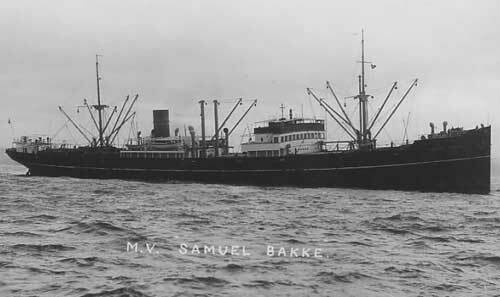 Samuel Bakke arrived her destination on Aug. 28, and a couple of weeks later, she joined the westbound Convoy ON 202 (ONS 18), in which Oregon Express and Skjelbred were sunk. Again, the Commodore's report and several other reports are available. She now served as the Vice Commodore's ship for Convoy HX 264*, which left New York on Oct. 31 and arrived Liverpool Nov. 17. This convoy is not yet available among the HX convoys included on my website, but will be added. Her voyages in this period are shown on Page 4. Her last convoy voyage that year was made in Convoy ON 215*, departing Liverpool on Dec. 9, arriving New York Dec. 28 (Commodore in Abraham Lincoln). In Jan.-1944, she sailed in Convoy HX 275 from New York, bound for Liverpool with general cargo, her captain serving as Vice Commodore. She returned to the U.S. in Convoy ON 224, which left Liverpool on Febr. 14 and arrived New York on March 2. The Norwegian Fernmoor, Molda, Pan Scandia, Skaraas and Vanja are also listed. On March 21, Samuel Bakke headed back to the U.K. with Convoy HX 284, general cargo for Liverpool (Commodore in Abraham Lincoln). She subsequently joined the westbound Convoy ON 234*, which left Liverpool on Apr. 26, and arrived New York May 12. Later that month, she acted as Commodore Vessel for Convoy HX 293, general cargo for Liverpool. In June, she's listed as the Vice Commodore's ship for Convoy ON 242* (from Liverpool June 25, to New York July 11), and I now have her in Convoy HX 301 from New York, bound for Manchester with general cargo, again serving as the Vice Commodore's ship (the Commodore was in Reinholt). Samuel Bakke arrived Manchester on Aug. 11/12 (Page 4), later serving as Commodore Vessel for Convoy ON 250*, departing Liverpool Aug. 24, arriving New York Sept. 7. On Sept. 28, she joined Convoy HX 311, bound for Liverpool with general cargo, returning with Convoy ON 263* (from Southend Oct. 29, to New York Nov. 15 - Samuel Bakke was again chosen as Commodore Vessel). She commenced her return voyage in Convoy HX 323 on Nov. 29, again bound for Liverpool with general cargo (serving as Commodore Vessel - Vice Commodore was in Laurits Swenson), then joined Convoy ON 274* in order to return to New York (departure Liverpool Dec. 24, arrival New York Jan. 8-1945 - yet again serving as Commodore Vessel). In Jan./Febr.-1945 she served as Commodore Vessel for Convoy HX 334 from New York (Acanthus is named among the escorts). Samuel Bakke's destination is given as Hull, general cargo and explosives; according to Page 4, she arrived Hull on Febr. 10, and as can be seen, she subsequently spent a long time there. In March, we find her in the westbound Convoy ON 293*, which left Southend on March 27 and arrived New York Apr. 15 (Commodore in Tungsha). At the end of that month, she was again chosen to be the Commodore Vessel (Commodore R. King), this time for Convoy HX 353*, which left New York on Apr. 29 and arrived Liverpool on May 15. In other words, VE Day was celebrated at sea. Her last Trans-Atlantic convoy voyage was made in Convoy ON 305*, which departed Southend on May 26. Samuel Bakke, which had again served as Commodore Vessel, arrived Philadelphia on June 11, and when she returned to Liverpool later that month, no convoy was required. Her subsequent voyages (to Apr.-1946) are shown on Page 5. * The ON convoys will be added to individual pages in my Convoys section in due course, with more information on each. In the meantime, the ships sailing in them (and escorts) are named in the section listing ships in all ON convoys. As will be seen, they all had several Norwegian ships. Additionally, the entire HX series will be updated and completed (including the already existing convoys - some have already been updated), but for now, see ships in all HX convoys. The ship and company (Skibs-A/S Samuel Bakke, Haugesund) were transferred to Christian Haaland, Haugesund in July-1947. (This transfer may have something to do with the fact that Knut Knutsen died in 1946 and Chr. Haaland, his son in law, inherited some of Knutsen's companies and ships). In that company's Concordia Line from 1948, as Nybakke from 1955. Taken over by D/S A/S Varøy (Vibran Shipping/Knut Knutsen), Haugesund in Jan.-1956, renamed Samuel Bakke. Sold in April-1965 to Kapechico Cia. de Navigation S.A., Piræus, and renamed John Lybe. Abandoned on Dec. 2-1965 following a fire in the engine room southwest of Cape Finisterre, when on a voyage from Arkangelsk to Alexandria. Towed to Vigo, Spain on Dec. 31 and beached, later broken up by Spanish breakers. Back to Samuel Bakke on the "Ships starting with S" page. The text on this page was compiled with the help of: "Nortraships flåte", J. R. Hegland, "Krigsseileren", No. 2, 1971, "Våre motorskip", Leif M. Bjørkelund & E. H. Kongshavn. and misc. (ref. My sources).